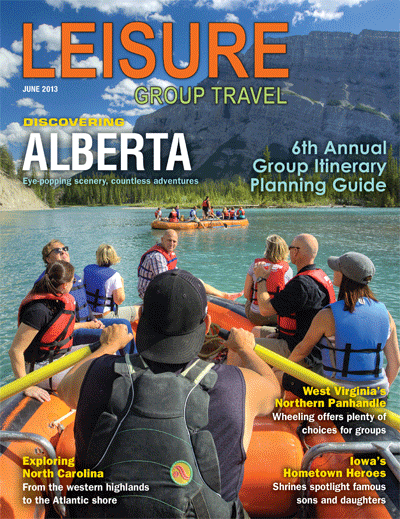 The sixth annual Group Itinerary Planning Guide highlights June’s Leisure Group Travel, featuring 39 sample itineraries submitted by CVBs and other tourism organizations. Divided into South, Midwest, West, Northeast and Canada, the planner provides day-by-day details on trips that tour organizers may wish to offer their groups. Destinations range from Virginia Beach and Savannah to Milwaukee and Wisconsin Dells. A full page is devoted to each itinerary. 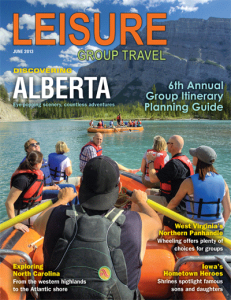 June’s cover story spotlights the province of Alberta, famed for vacation hotspots like Banff and Jasper national parks in the Canadian Rockies. The article “Iowa’s Hometown Heroes” features museums and birthplaces across the state that spotlight local sons and daughters who made a splash on the national stage. Other Midwest coverage includes a look at how the oil boom is energizing tourism in North Dakota. Featured destinations in the West are Great Falls, Montana; and downtown Seattle. The story on scenic rail trips looks at some of North America’s most popular tourist trains, including the Rocky Mountaineer, Mt. Washington Cog Railway and Alaska Railroad. A glimpse of top sightseeing cruises gives group planners a number of excursion and mealtime options on rivers, lakes and the ocean. Also in the June issue, readers will explore North Carolina, from the mountains to the seacoast; Wheeling, West Virginia; and Washington, DC.